How do we know the current warming trend is not caused by the sun? Here is a 3-minute video explanation from the US National Research Council. Records of sunspot activity date back hundreds of years. These records are based on observations, not instrumentally acquired data. In the late 1970s, satellites became a source of instrumentally recording solar output, but have not yet had the opportunity to meaningfully contribute to long term trend analysis due to their limited time scale (1). 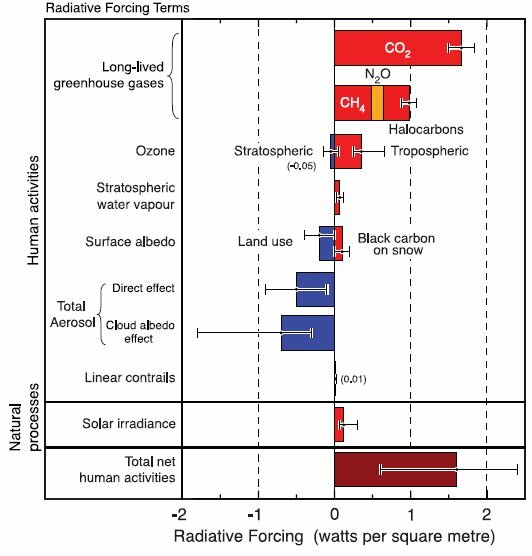 The Intergovernmental Panel on Climate Change (IPCC) has estimated the radiative forcing attributable to solar irradiation as well as other contributors. (Figure 1) Based on the data, it is believed that the Sun’s change in radiative forcing (~ 0.09 W/m2) since the start of industrial era (about 1750) is much less than that of greenhouse gases (~ 2.6 W/m2) (2). The Sun’s role in global warming will become clearer as more time passes, as longer data records will be available for study. 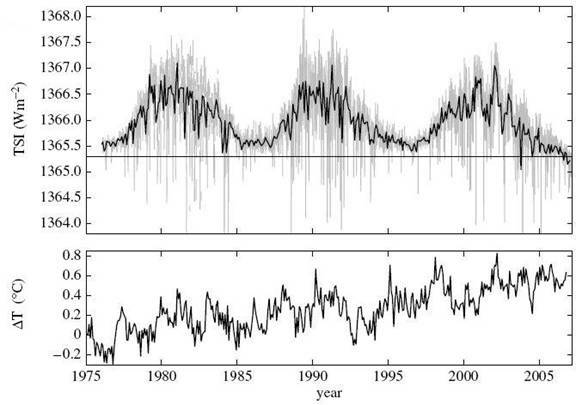 This study shows that the Earth’s surface air temperature does not respond to changes in the solar cycle. While the global average temperature shows an increasing trend, solar irradiance has gone up and down with no net change and with no correlation to temperature.